Our next tattooed poet, Khadija Anderson, expressed an interest in our Tattooed Poets Project last year, so we're happy we were able to finalize her contribution for 2013. 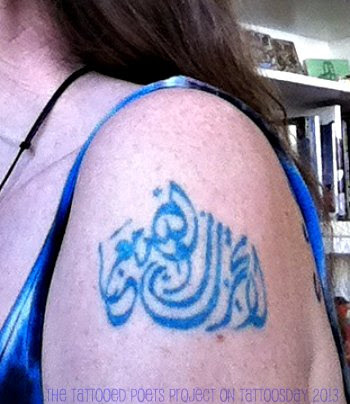 "My tattoo is Arabic calligraphy of a verse from the Qur'an (9:40), " laa ta'hazen fa innah Allaha maana". The translation is 'Don't give up hope, Allah is with us.' I chose this design because the calligraphy is gorgeous, I love the humanitarian message of the verse, and I like to show that I am a Muslim in a non-traditional way. A friend of mine, Russell Moore, did the tattoo in my living room in Los Angeles in 2008 shortly after I moved back to LA. It was the 5th of my 7 tattoos." Khadija Anderson returned in 2008 to her native Los Angeles after 18 years exile in Seattle. Khadija's poetry has been published in Pale House, Unfettered Verse, Washington Poets Association's online whispers & [Shouts], CommonLine Project, Qarrtsiluni, Gutter Eloquence, Killpoet, wheelhouse 9, and many other online and print journals. Khadija was a 2009 Pushcart Prize Nominee and she holds an MFA in Creative Writing from Antioch University Los Angeles. Her first book of poetry, History of Butoh, was published in 2012 by Writ Large Press. You can learn more about her at: http://khadijaanderson.com. Thanks to Khadija Anderson for her contribution to the Tattooed Poets Project on Tattoosday!